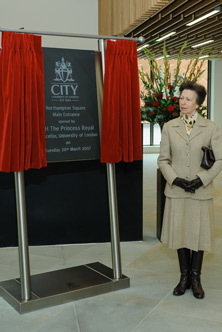 HRH the Princess Royal visited City, University of London on Tuesday 28th March 2017 to officially open the new main entrance. 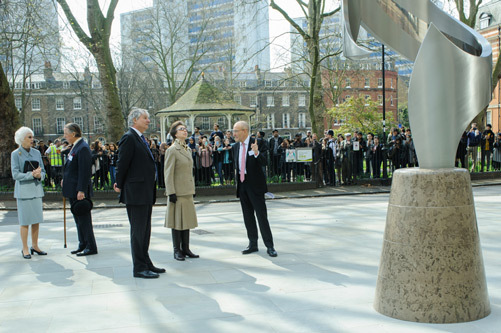 In her role as Chancellor of the University of London, HRH The Princess Royal toured the new main entrance and met more than 100 staff and students of City. This included representatives from each School and teams from Professional Services. The new main entrance is part of a multimillion-pound project to transform the City estate. The project was a key part of the University’s Vision and Strategy and aimed to create a sense of community and provide a high quality and inspiring environment for students and academics. The new main entrance includes social spaces, a coffee shop, seating areas and exhibition space. The complex was designed to improve the flow and access between different parts of the University while serving as an impressive point of arrival. Links between the different buildings improve how students and staff move around the University, with the grand staircase providing links to Tait Building, College Building and other areas of the main building. The visit concluded with HRH the Princess Royal unveiling a plaque to mark the occasion. Other elements of the tour included viewing a ‘walk-over’ plaque detailing important dates in City’s history. These include establishment in 1894, appointment by Royal Charter in 1966 and accession to the University of London in 2016. The plaque’s design drew inspiration from Clerkenwell’s historic connection with clock making. A new sculpture outside the new entrance was also revealed. The sculpture represents one of the cloaks that form part of City’s crest. It is made from stainless steel, a material chosen for its links with Northampton Square. Sir Henry Bessemer, the inventor of the steel mass production process, lived in the Square from 1833. 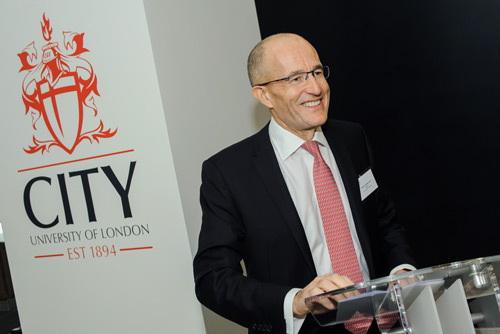 "It was an honour to welcome her Royal Highness, Chancellor of the University of London on an important day in the history of City as we opened our grand new entrance and accompanying artworks. "Our new entrance, spiral sculpture and stone floor feature are confident symbols of the tremendous progress we have made at City over the last few years, including the joining of the University of London last year. Over the coming decade we will retain our unwavering focus on quality that has served us so well in recent years, we will grow where we can without compromising quality and we will do so in partnership with others within London, across the country and around the world."